Christmas is nearly upon us, and many are already getting ready to stock up on luxuries, gifts and decorations. Oranges and nuts sit happily in greengrocer windows, while boxes of cakes, chocolates and figs make their way into shopping trolleys across Britain. For us though, it’s all about making Christmas your own – and what better way to do that than for you and the family to get creative and produce some festive treats? Check out our guide to some of the best Christmas essentials you can make from home! 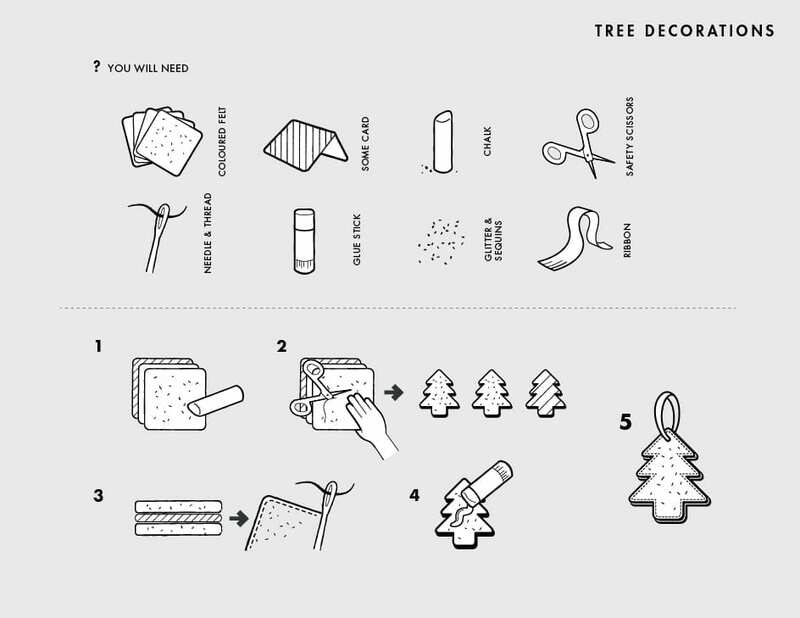 Ideal for both kids and adults, these decorations will give your tree a real old-fashioned Christmas look, and provide hours of festive entertainment for the whole family. Step 1: Take two pieces of felt and one piece of card. Place them on top of each other and, using the chalk, draw out your chosen Christmas design on the top piece of felt. You could make lots of different shapes, such as trees, angels or stockings. Step 2: Once you’ve drawn your design, hold the felt and card together and cut around the outline so that you have three identical shapes, two with felt and one with card. Step 3: Place the card in between the two pieces of felt, and sew around the edge. You could use gold or silver thread to make it extra sparkly! Step 4: Use the glue to decorate your design with glitter, sequins, or even other felt shapes to create an applique effect. Step 5: Take a piece of ribbon, cut to the desired length and sew the ends to your decoration, before hanging on the Christmas tree to shine among the fairy lights! There’s something incredibly satisfying about making your own Christmas food – the whole family can enjoy making it together, and your finished products are often just the thing for handmade gifts, Secret Santas and last-minute parties – for kids and grown-ups alike! Here are just some of our favourites. The ultimate in Christmas cuisine, there really is nothing that beats the humble mince pie. Who doesn’t note their “first pie of the season”? Making them should be a shared experience; taking turns adding ingredients to your mincemeat mix and arguing over who can make the best pastry is as satisfying as sitting back with a cup of tea and taking that first indulgent bite. Ours is a variation on a Delia classic, made the day before you need them, complete with a foolproof pastry recipe that will softly crumble and melt in the mouth. Step 1: Combine all the ingredients except for the brandy, whiskey and dark rum in a large, ovenproof bowl, and mix thoroughly (if you have little helpers, this is the time to employ them!). Once fully mixed, cover the bowl with a clean cloth and leave somewhere cool for around 12 hours. Step 2: The next day, pre-heat the oven to 120C (100C for fan ovens). Cover the bowl loosely with tin foil, and bake the mixture for about three hours. Step 3: Take out of the oven and stir well. Stir occasionally for the next hour, as it cools. The shredded suet will have coagulated – don’t worry about how it looks, it will encase all of your other ingredients and lock in all the flavour! Step 4: Once fully cooled, add the three spirits as generously as you like (our measurements are a rough guide!) and stir well. 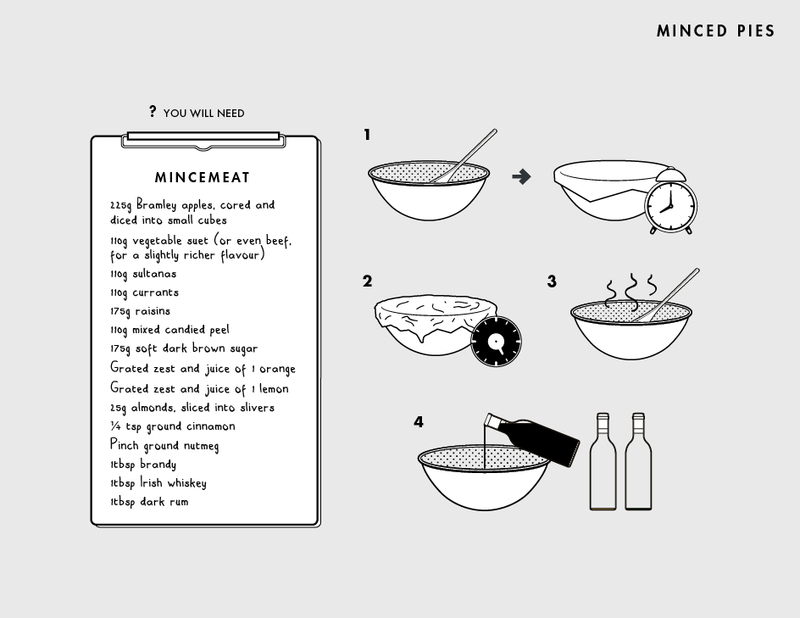 Your mincemeat is now ready to use, and can be cooked with immediately or will last for another year or so if packed into sterilised jars. Step 1: Rub butter into flour with your hands, working quickly with your fingertips. Step 2: Mix in caster sugar and a pinch of salt. Step 3: Combine into a ball with your hands, and knead briefly. It should be fairly firm. You can use this straight away or leave in the fridge for later. Step 1: Preheat oven to 200C (180C for fan ovens). 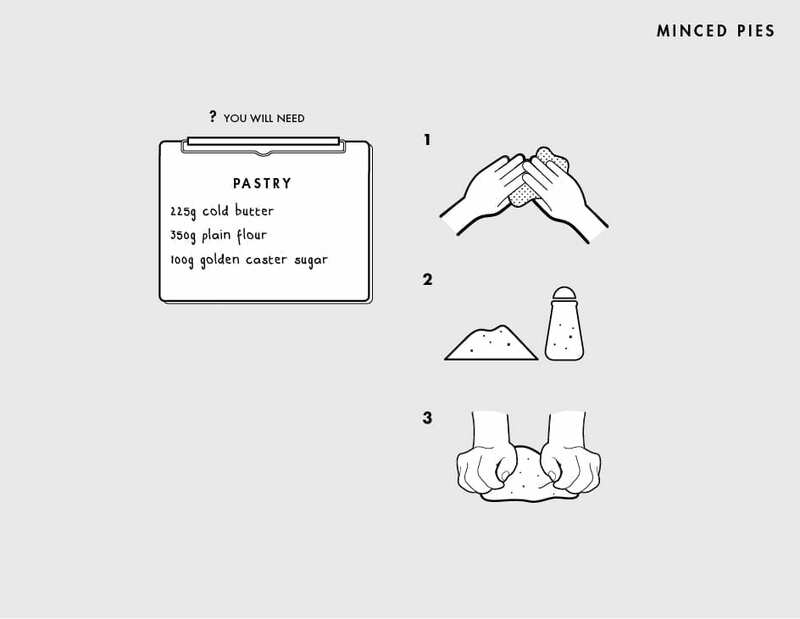 Line two muffin trays by pressing a walnut-sized ball of pastry into the bottom of each hole, ensuring the surface is fully covered. 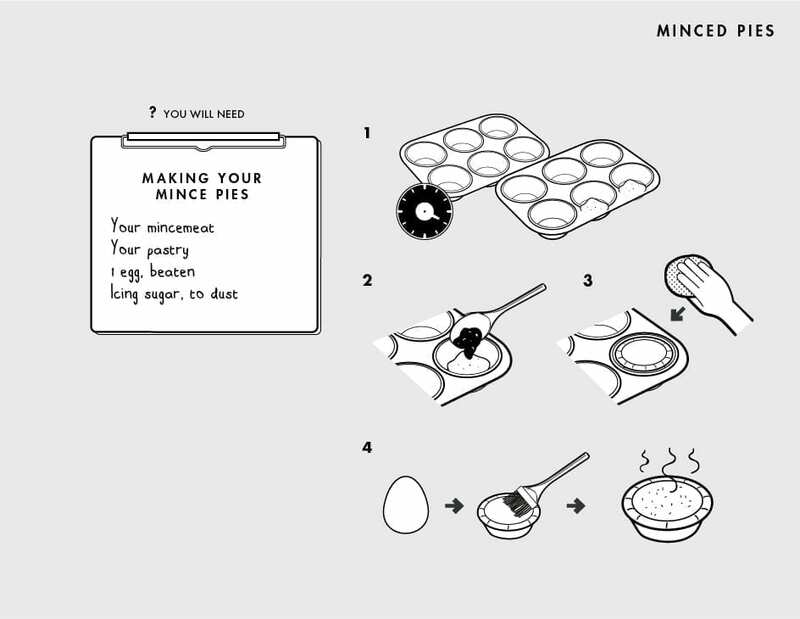 Step 2: Spoon about a tablespoon of mincemeat into each pastry case. Step 3: Take slightly smaller balls of pastry and pat them down into a large circle with your hands, then place as a lid onto each pie. Apply a little pressure around the edge to seal the lid to the base. Step 4: Brush beaten egg over the top of each pie, then bake for 20 minutes, or until golden. Leave to cool, then remove to a wire rack. Using a sieve, dust icing sugar over them just before serving. Don’t forget to try one while they’re still warm! I’ll try making the mince pies! I would love to make experiment with different flavors.